The project currently keeping me entertained are these gorgeous coasters from ZoomYummy. Check out her other projects, they are great. I have altered the pattern slightly to get them to a size I like and this is the result. This entry was posted in Crochet, Housewares and tagged Coaster, crochet, crochet coaster, Pretty, ZoomYummy. Bookmark the permalink. Oh! I am a big fan of Zoom Yummy’s! My first crochet project in decades was from her big flower party pattern! 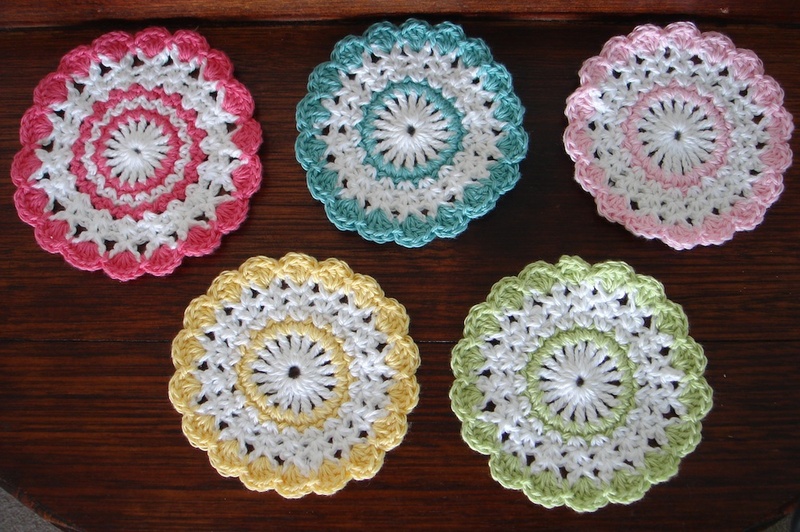 Next was the sweet coasters, and I didn’t know then what I know now…the crochet hook size and the size of the yarn are specific to a pattern! LOL! My first sweet coaster I tried was size 3 yarn and a J/10 6.0mm hook. WOW! I had what can only be described as hyperbolic crochet going on! The only part that laid flat was row 1. I learned fast from that! I am enjoying your blog! You have pretty color choices and are very cheerful! Keep up the good work! I am laughing a lot about that first attempt (not at you but with you). It is wonderful to hear from someone that enjoys her work. I might have to revisit some of her patterns not that you have mentioned her. Thank you for your kind words as well. It has brought a smile to my face!